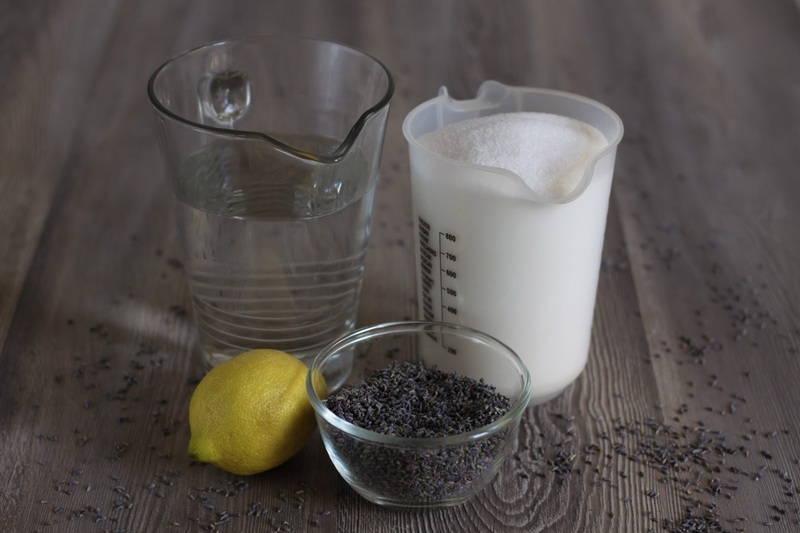 An easy to follow recipe for the perfect homemade lavender syrup. Can you feel the fresh summer breeze on your skin? Can you smell the flowers? Can you see the stunning endless lavender fields around you? 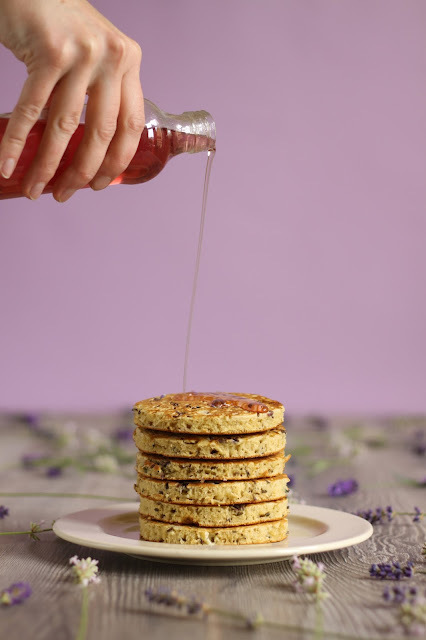 That's right - the lavender season already started and with it came the new recipes. Today we want to show you how to make lavender syrup! We are going to use it for our next pancake creation (stay tuned!) 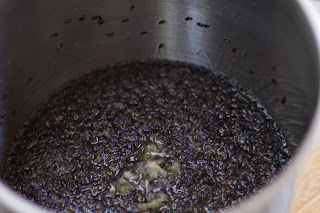 and decided to dedicate a whole post to this sweet and elegant syrup - it's not just for pancakes, there are countless ways to add it to diverse dishes and drinks! 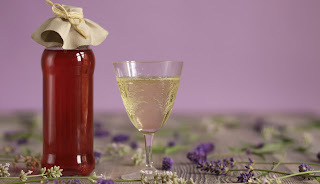 Here is a step by step guide to brewing your very own homemade lavender syrup! And yes, it is vegan, gluten free and you can make it organic. Note that even though it doesn't take much time or preparation to make the syrup, it does need to sit for two days, so count that time into the process. We are going to start by dissolving the sugar in 750ml of water in the pot. Bring the mixture to a medium-heat and wait just until all the sugar crystals are gone. In the next step we will chop up the lemon in thin slices; use a sharp knife, we only need the fruit flesh. Throw it in the pot and let it all simmer for about 5 minutes. 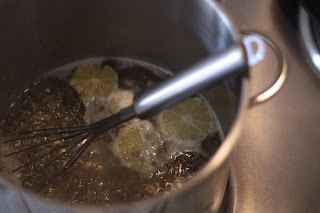 Take the pot off the heat, turn of off and wait till the sugar-lemon-mixture has stopped simmering. Add your lavender buds and again: if you use dried ones, 35g is fully enough to get your taste-buds wet and running. Good Job You just made the first major step to brew your own lavender syrup! Cover the pot with a lid and you can chill for the next two days, just like the syrup. It needs that time to get infused with the lavender flavor. Have a look at the syrup after two days. You smell that? That's the scent of true DIY Action! The syrup itself should have a pink/rosé color and smell just incredibly sweet. The store bought lavender syrup is usually purple-sh, which means they added artificial blue coloring, but we are not going to do that, let's keep it natural. But the lemon and the lavender are still in there. In order to get them out, let us use a thin towel to sift out the blossoms and lemon pieces - from one pot to another pot. There is no need to throw the sugared blossoms away! We will show you what to do with them in our next recipe! :) For the moment, let them dry on a sheet of baking parchment. Last step, mate. You nearly did it! We are going to bring the syrup to a simmering heat one more time and fill it up in the bottle white its hot! Make sure your bottles are super clean. 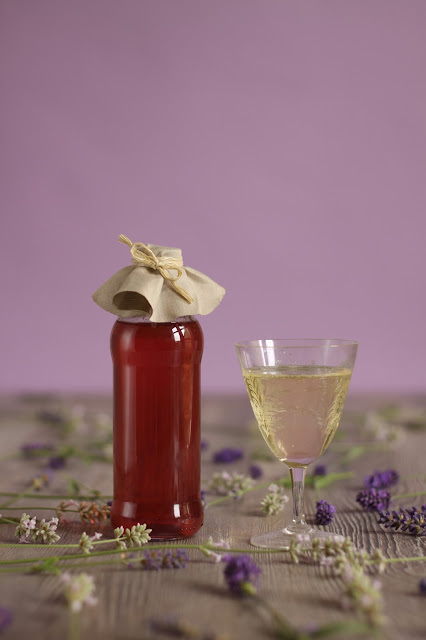 Let the bottles cool and your own home-brewed lavender syrup is ready to be used! Use it as a topping for pancakes, add a tea spoon of it to champagne (we called this drink Lui - and it's your new favorite companion for a brunch with your friends! ), dissolve a little bit of the syrup in tea instead of sugar or just pour it over anything that your imagination tells you to! You can make a pretty package for it and give it as a unique present to your loved ones - this one will be a hit at any summer party! Pancake Stories are a team of 3 pancake enthusiasts based in Halle, Germany. Taking a classic breakfast dish to the gourmet level, one pancake at a time. Thanks for sharing this recipe - can you please let me know the shelf life? Thanks! We are a Germany-based food blog about pancakes. Sharing recipes and taking a classic breakfast dish to the gourmet level, one pancake at a time. Feel free to write us an email to info@pancakestories.com if you have any questions.